Over the course of her life, Mary Holiday Black has been a pioneer in the revival and preservation of Navajo basket weaving. Trained to weave at the age of 11, she was among the first to incorporate pictorial representations of Navajo belief and culture into baskets, giving birth to the form now known as Navajo "story baskets." In 1995, Mary received the Utah Governor's Folk Art Award; a year later her work was recognized with a National Heritage Fellowship from the National Endowment for the Arts. Mary has contributed substantially to the apprenticeship of many current Navajo weavers, including 9 of her 11 children, and her granddaughter, Kayla. 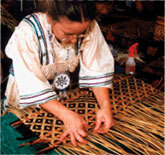 Mary was a participant in the 2006 Smithsonian Folklife Festival.